CAPPAuto is a business process, Enterprise Resource Planning (ERP) solution designed to meet the distinct needs of auto jobbers and automotive distribution companies operating across North America. Efficient to deploy and easy to use, the system will: Automate your processes, Increase your productivity, Streamline your operations, Facilitate your business intelligence and Improve your customer service. From front-end sales information to back-end financial reporting features, CAPPAuto does it all. The real-time, any-time Open to Purchase, Transfer and Return Logs and email / fax interface create seamless and secure information exchange. Collaboration across your departments, locations, customers, warehouses and suppliers keeps you top of mind and easy to do business with -- a great advantage in your cut-throat competitive market. You can also choose from a selection of optional, add-on modules such-as E-Commerce, Delivery Dispatch, and EDI. Click here to learn more about CAPPAuto’s features . 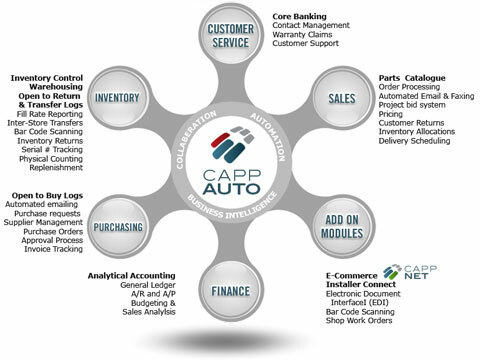 Click on the diagram below for further details on CAPPAuto’s features and functionality. CLICK HERE to contact a knowledgeable CAPP Associates ERP expert to start building your own CAPPAuto business automation solution today.